Sasaki, D. (2009). Neotropical Onagraceae. Herbs (sometimes epiphytic ), subshrubs, shrubs, lianas, rarely trees; often with oil-cells (not gland -dotted); mesophytic, xerophytic, hydrophytic, helophytic, rarely halophytic. Leaves simple , alternate , opposite or whorled (sometimes a basal rosette ), petiolate to sessile , stipules present, intrapetiolar and caducous , or absent, entire or dissected ( pinnatifid or runcinate), margins entire , serrate or dentate . Inflorescences usually racemes, spikes, panicles or corymbs; terminal or axillary ; or flowers solitary. Flowers hermaphrodite or rarely unisexual (some Fuchsia), actinomorphic or zygomorphic , floral tube present or absent (Ludwigia and some Lopezia); calyx (3-)4-5(-7)- merous , lobes free , prefloration valvate ; corolla (3-)4-5(-7)- merous or sometimes absent (some Fuchsia), petals free , valvate or imbricate ; stamens diplostemonous or sometimes haplostemonous, rarely 1-2 (Lopezia); anthers basifixed or dorsifixed; disc present; ovary inferior, usually 4-5-carpelate and 4-5-locular, syncarpous, placentation axile or parietal ; style 1, apical; stigma lobed , clavate or globose . Fruits capsules or berries (Fuchsia), rarely an indehiscent capsule (some Oenothera) or an aggregate fruit (Gongylocarpus); seeds 1-numerous; hairy or glabrous , winged or not- winged . Camissonia Link: one species endemic to South America (Peru to Chile and Argentina), all others (c. 11 species) endemic to North America. 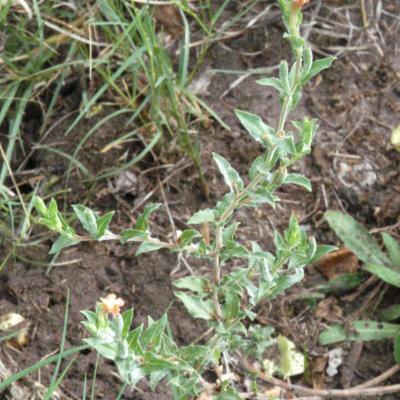 Epilobium L.: Mexico, Central and South America. Fuchsia L.: Mexico, Central and South America. Gongylocarpus Schldl. & Cham. : one species endemic to Guatemala and Mexico. Hauya Moçino & Sessé ex DC. : Mexico and Costa Rica. Lopezia Cav. : Mexico and some countries in Central America. Ludwigia L.: from Mexico to South America. Oenothera L.: from Mexico to South America (a few in Central America). 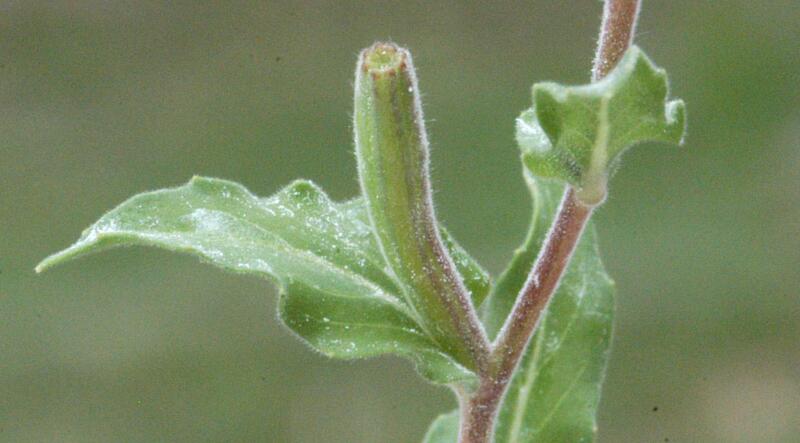 Lythraceae has a very variable morphology similar to Onagraceae, but the first differs from the second mainly by the superiorovary (rarely semi-inferior) and the absence of stipules. Myrtaceae differs from Onagraceae mostly by the presence of gland -dotted leaves. Camissonia : C. dentata Reiche. is the only species of this genus with a Neotropical distribution. Annual herb. Leaves are alternate. Stipules absent. Flowers actinomorphic, 4-merous and grouped in spikes. Gongylocarpus : One of the two species of Gongylocarpus occur in the Neotropics (G. rubricaulis Cham. & Schltdl.). The fruit in Gongylocarpus is unique in the family: hardened and embedded within the stem, forming an aggregated fruit. Annual herb to a low shrub. Leaves alternate, opposite near base, often succulent. Stipules absent. Flowers actinomorphic, 4-merous and grouped in spikes. Hauya : There are only two species in Hauya (H. elegans DC. and H. heydeana Donn.Sm. ), which are shrubs or trees (to 25 m). Leaves alternate. Stipules present (caducous). Flowers actinomorphic, 4-merous and solitary. Seeds winged. 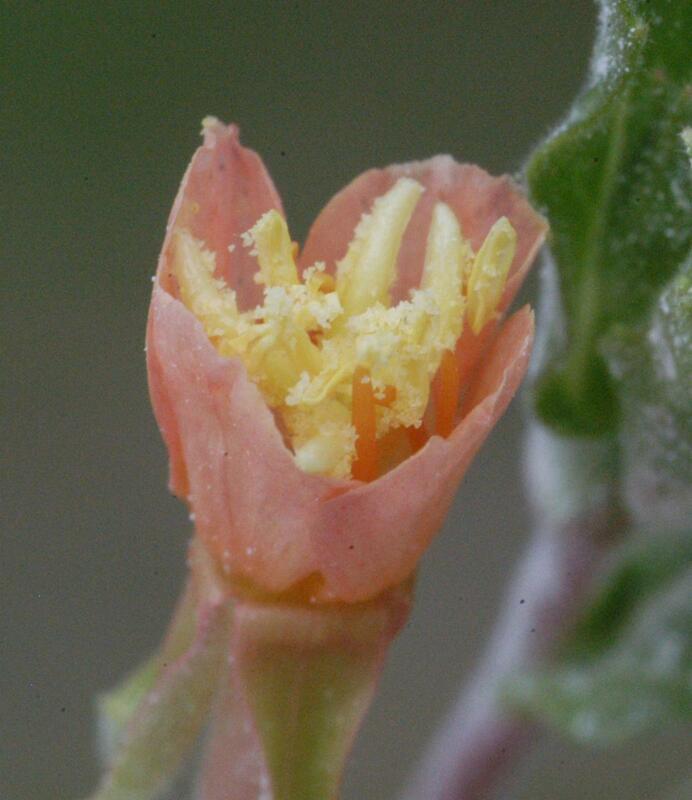 Lopezia : It differs from the other genera by having only 2 stamens or 1 stamen and a staminode. Herbs or subshrubs. Leaves spirally arranged, sometimes opposite basally. Stipules present, usually caducous. Flowers zygomorphic (in different degrees), 4-merous and grouped in racemes, corymbs or panicles. Oenothera : This genus is more diverse in North America. Herbs with leaves alternate, usually with a basal rosette. Stipules absent. Flowers hermaphrodite, actinomorphic or zygomorphic, (3-)4-merous, grouped in spikes, racemes or corymbs, or flowers solitary in leaf axils. Epilobium , Fuchsia and Ludwigia : see "Notable genera". Fuchsia: shrubs (sometimes scandent), lianas, epiphytes, sometimes trees; leaves opposite and decussate, alternate or whorled; stipules present, small, usually deciduous; inflorescences racemes or solitary flowers in leaf axil; flowers bisexual or unisexual, actinomorphic; floral tube present, elongate; sepals 4; petals 4 or absent; androecium diplostemonous, anthers basifixed; ovarylocules 4; fruits berries; seeds numerous. 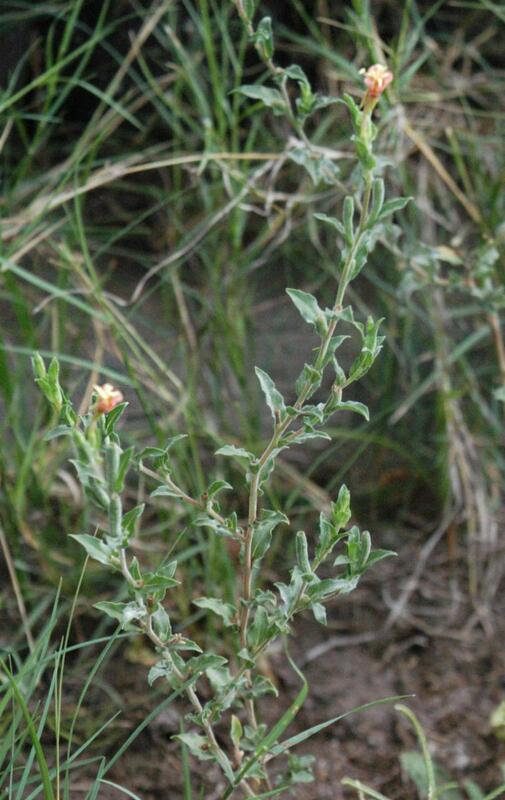 Epilobium: herbs; leaves opposite and decussate (sometimes also alternate distally); stipules absent; inflorescences spikes, racemes, panicles or solitary flowers; flowers bisexual, actinomorphic, rarely zygomorphic; floral tube present, short or elongate; sepals 4; petals 4; androecium diplostemonous; anthers dorsifixed or rarely basifixed; ovarylocules 4; fruits capsules; seeds many. Ludwigia: herbs, shrubs, rarely small trees; leaves alternate; stipules present, often deciduous; inflorescences spikes, racemes or clusters or solitary flowers in leaf axils; flowers bisexual, actinomorphic; floral tube absent; sepals 4-5(-7); petals 4-5(-7); androecium haplostemonous or diplostemonous, anthers dorsifixed or basifixed; ovarylocules 4-5(-7); fruits capsules; seeds numerous. Leaves simple (alternate, opposite or whorled). 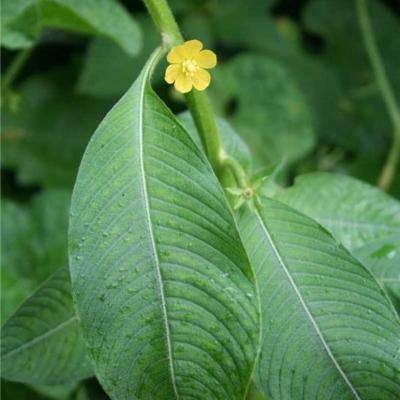 Shrubs or herbs (sometimes epiphytic herbs, lianas or rarely trees). Calyx and corolla usually 4-5-merous. Fruits usually capsules or berries. Eight Neotropical genera (see above). 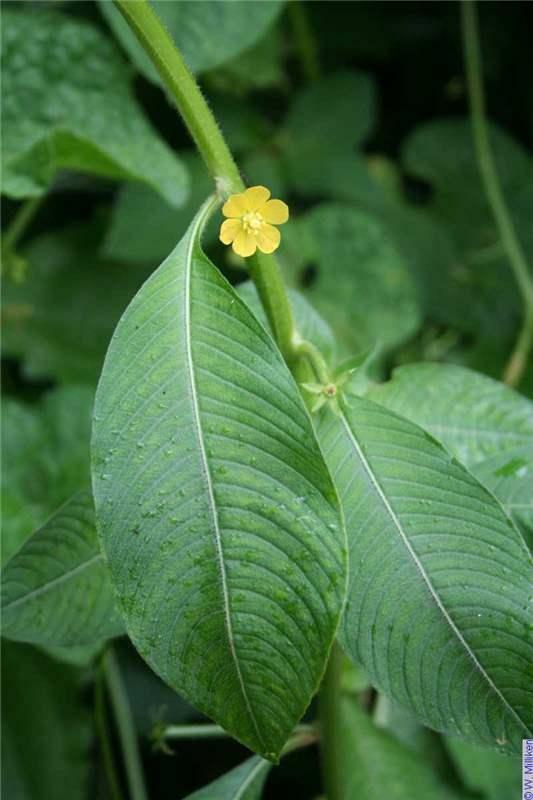 Most species of Onagraceae consist of North American herbs. Eight genera are native to the Neotropics, none of them endemic. Some species are cultivated as ornamentals (Clarkia Pursh, Fuchsia, Oenothera). Some species are naturalized or invasive plants (Ludwigia). There are eight genera (Camissoniopsis W.L. Wagner & Hoch, Clarkia, Eremothera (P.H. Raven) W.L. Wagner & Hoch, Eulobus Nutt. ex Torr. & A. Gray, Gayophytum A.Juss., Megacorax S.González & W.L.Wagner, Tetrapteron ( Munz) W.L.Wagner & Hoch, Xylonagra Donn.Sm. & Rose) that occur in non-tropical Mexico (mainly in Baja California), most of them also found in the United States. 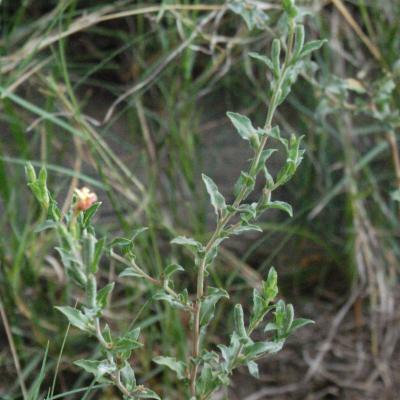 Gayophytum and Clarkia have a disjunct distribution in Temperate Chile and Argentina. Although these genera may occur in regions with climate similar to tropical Mexico, their geographic distribution is above the Tropic of Cancer and they were not considered here as Neotropical. 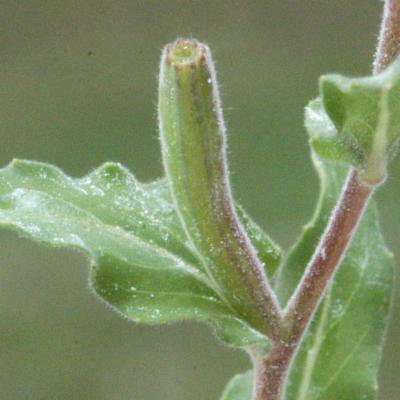 Calylophus Spach was described as a genus in Onagraceae; however, in a recent revision it is considered to be a section in Oenothera (Wagner et al. 2007). The phylogenetic relationships and evolution of Onagraceae have been intensively studied and the family is considerably well-known in many aspects like: cytogenetics, palynology, physiology, ecology, anatomy and morphology. However, there is a lack of recent taxonomic treatments for many groups. The Onagraceae is placed in the order Myrtales. 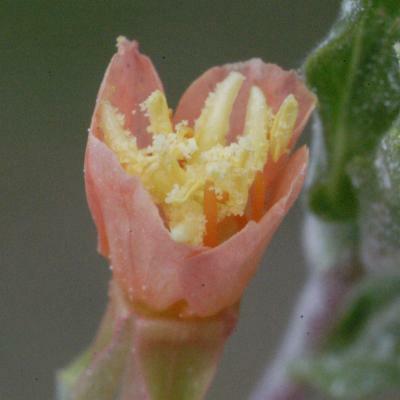 It is closely related to the Lythraceae and more broadly with the Melastomataceae, Myrtaceae, Vochysiaceae and others according, to APG (Stevens 2008). Baum, D.A., Sytsma, K.J. & Hoch, P.C. 1994. The phylogeny of Epilobium (Onagraceae) based on nuclear ribosomal DNA sequences. Syst. Bot. 19: 363-388. Berry, P.E. 1982. The systematics and evolution of Fuchsia sect. Fuchsia (Onagraceae). Ann. Missouri Bot. Gard. 69: 1-198. Berry, P.E. 1985. The systematics of the apetalousFuchsia of South America, Fuchsia sect. Hemsleyella (Onagraceae). Ann. Missouri Bot. Gard. 72: 213-251. Berry, P.E. 1989. A systematic revision of Fuchsia sect. Quelusia (Onagraceae). Ann. Missouri Bot. Gard. 76: 532-584. Berry, P.E. & Breedlove, D.E. 1996. New taxa of Fuchsia from Central America and Mexico. Novon 6:135-141. Berry, P.E. & Hermsen, E. 1999. New taxa of Fuchsia (Onagraceae) from northern and central Peru. Novon 9: 479-482. Breedlove, D.E., Berry, P.E. & Raven, P.H. 1982. The Mexican and Central American species of Fuchsia (Onagraceae) except for sect. Encliandra. Ann. Missouri Bot. Gard. 69: 209-234. Carlquist, S. & Raven, P.H. 1966. The systematics and anatomy of Gongylocarpus (Onagraceae). Amer. J. Bot. 53: 378-390. Dietrich, W. 1977 . The South American species of Oenothera sect. Oenothera (Raimannia, Renneria; Onagraceae). Ann. Missouri Bot. Gard. 64: 425-626. Dietrich, W., Raven, P.H. & Wagner, W.L. 1985. Revision of Oenothera sect. Oenothera subsect. 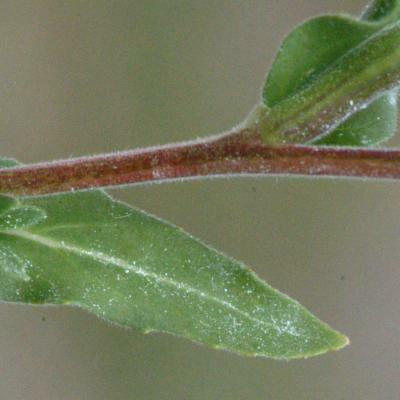 Emersonia (Onagraceae). Syst. Bot. 10: 29-48. Dietrich, W. & Wagner, W.L. 1988. Systematics of Oenothera section Oenothera subsection Raimannia and subsection Nutantigemma (Onagraceae). Syst. Bot. Monogr. 24: 1-91. Dietrich, W., Wagner, W.L. & Raven, P.H. 1997. Systematics of Oenothera sect. Oenothera subsect. Oenothera (Onagraceae). Syst. Bot. Monogr. 50: 1-234. Hoch, P.C., Crisci, J.V. & Tobe, H. 1993. A cladistic analysis of the genus Lopezia (Onagraceae). Bot. J. Linn. Soc. 111: 103-116. Ramamoorthy, T.P. & Zardini, E.M. 1987. The systematics and evolution of Ludwigia sect. Myrtocarpus sensu lato (Onagraceae). Monogr. Syst. Bot. Missouri Bot. Gard. 19: 1-120. Raven, P.H. 1969. A revision of the genus Camissonia (Onagraceae). Contr. U. S. Natl. Herb. 37: 161-396. Solomon, J.C. 1982. The systematics and evolution of Epilobium (Onagraceae) in South America. Ann. Missouri Bot. Gard. 69: 239-335. Stevens, P.F. 2008. Angiosperm Phylogeny Website, version 9. http://www.mobot.org/MOBOT/research/APweb/. Wagner, W.L. 2004. 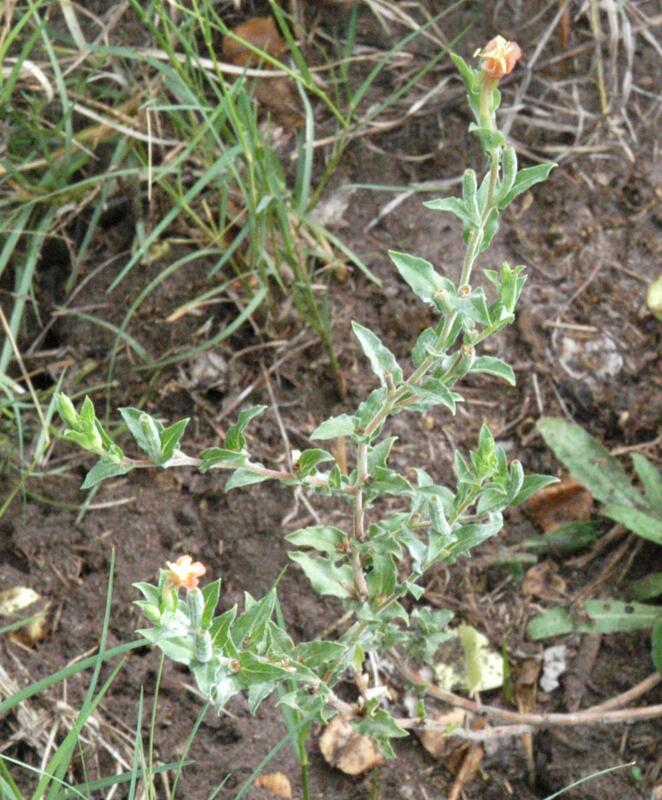 Resolving a nomenclatural and taxonomic problem in Mexican Oenothera sect. Hartmannia (Tribe Onagreae, Onagraceae). Novon 14: 124-133. Wagner, W.L. 2005. Systematics of Oenothera sections Contortae, Eremia, Pachylophus, and Ravenia (Onagraceae). Syst. Bot. 30: 332-355. Wagner, W.L., Hoch, P.C. & Raven, P.H. 2007. Revised classification of the Onagraceae. Syst. Bot. Monograph 83. 240 pp. Zardini, E.M. & Raven, P.H. 1992. 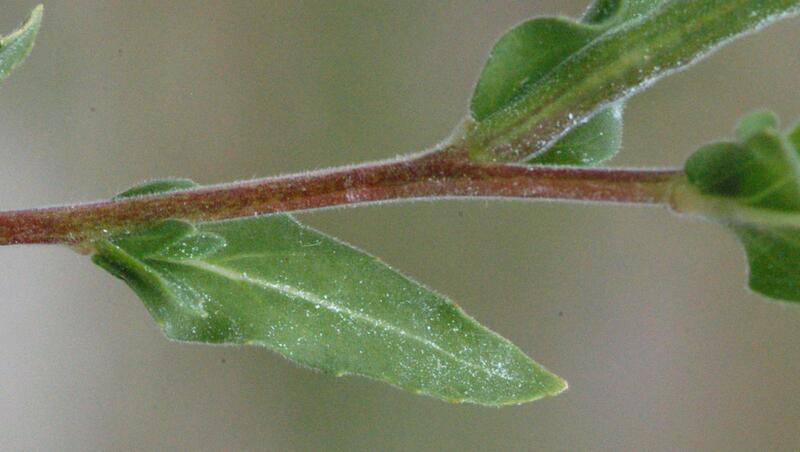 A new section of Ludwigia (Onagraceae) with a key to the sections of the genus. Syst. Bot. 17: 481-485. Hauya Moc. & Sessé ex DC.